For the past 8 years, NASA astronomers have been monitoring the Moon for signs of explosions caused by meteoroids hitting the lunar surface. "Lunar meteor showers" have turned out to be more common than anyone expected, with hundreds of detectable impacts occurring every year. They've just seen the biggest explosion in the history of the program. 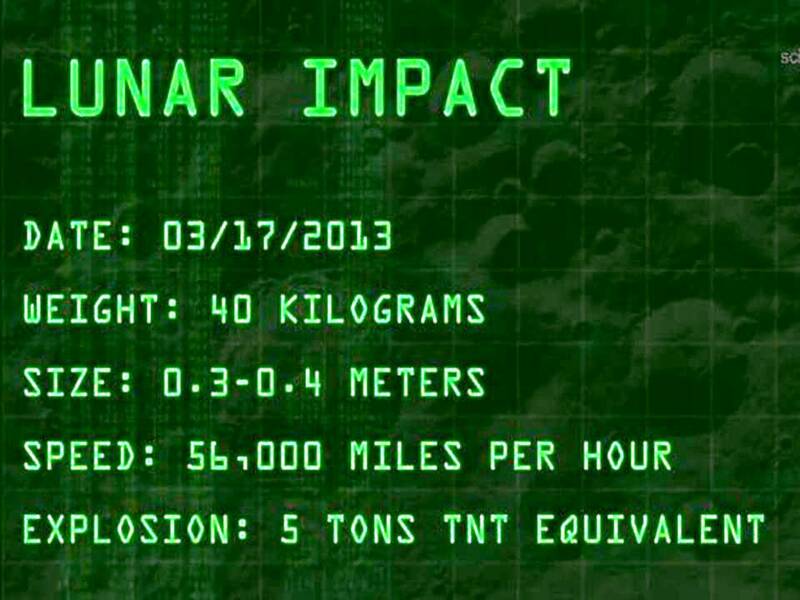 The 40 kg meteoroid measuring 0.3 to 0.4 meters wide hit the Moon traveling 56,000 mph. The resulting explosion packed as much punch as 5 tons of TNT. Unlike Earth, which has an atmosphere to protect it, the Moon is airless and exposed. "Lunar meteors" crash into the ground with fair frequency. 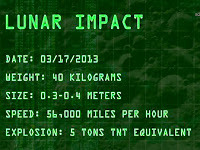 Since the monitoring program began in 2005, NASA’s lunar impact team has detected more than 300 strikes, most orders of magnitude fainter than the March 17th event. Statistically speaking, more than half of all lunar meteors come from known meteoroid streams such as the Perseids and Leonids. The rest are sporadic meteors--random bits of comet and asteroid debris of unknown parentage. I smell some thing fishy here. Meteor showers on the way!